Righteous indignation with a hook. (from Home Coming). Let's set the stage. 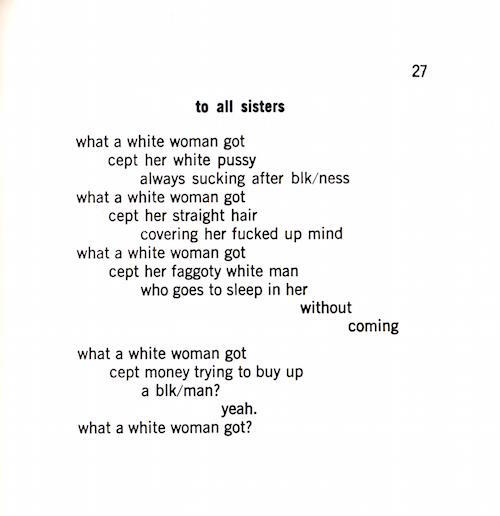 Don L. Lee in the intro: "are no trees in Harlem or on the westside of Chicago. The only use/beauty she/we see in a tree, at this time in space, is the number of rifle butts it will produce." what a white woman got? She's come a long way: "You rescued us from the tyranny of racism, sexism, homophobia, class and economic poverty . . . You. Prodigious singer. Of life and actions. And words . 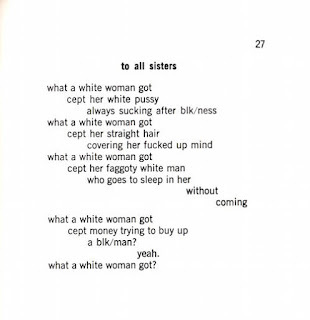 . ."
Sonia Sanchez introduction to Audre Lorde's A Burst of Light and Other Essays.